This task may seem simple, but there have been lots of repeated questions on this, so I’m finally blogging about it. Let’s start with an Individual Account. Tick off the 1st box (Individual). Most important thing to remember if it’s an individual application is that you need NOT fill out the ‘Secondary Account Holder’ portion. Look at the images first and then read the descriptions that follow. The first part is the ‘Personal Information’. This is pretty basic. It just asks for your personal details like name, address, contact numbers, etc. Make sure you put your correct Email address. COL Financial is an online brokerage, and hence, most of its correspondence will be via email. (Always check your Spam folder as well for COL’s initial email and add this email address to your Contacts). The 2nd part is ‘Additional Information’ and it asks about your employment details. If you are unemployed, just tick off that box and write N/A (Not Applicable) on the other boxes. Otherwise, answer all questions. The 3rd part is ‘Disclosures’. Again, pretty simple. Just answer either yes or no. If any part here doesn’t apply to you, just write N/A. The 4th part is ‘Financial and Investment Profile’. Just for compliance sake, let’s tick off our choices here. For the ‘Investment Objectives’, all you need is to number them according to your priority. a. ‘Capital Preservation’, for lack of better explanation, is if you want to preserve your capital. You are very conservative in your approach to investing in that you want a guaranteed rate of return or at least just a return of what you originally invested. b. ‘Long-term Investment’ is if you are ok to invest funds you won’t be needing for at least 5 years or more. c. ‘Growth’ is if you want your investments to grow at a rate faster than what regular banks give. d. ‘Speculation’ is if you have a very aggressive approach to investing. You are willing to take on higher risks just to have a higher rate of investment return. For Bank info, it is really up to you to fill this part out, but it is NOT mandatory that you have a bank account before you can open a COL account. If you don’t have one (or you just don’t want to divulge the info), you may just write N/A. On the signature part, just sign on the first line (Primary Account Holder). 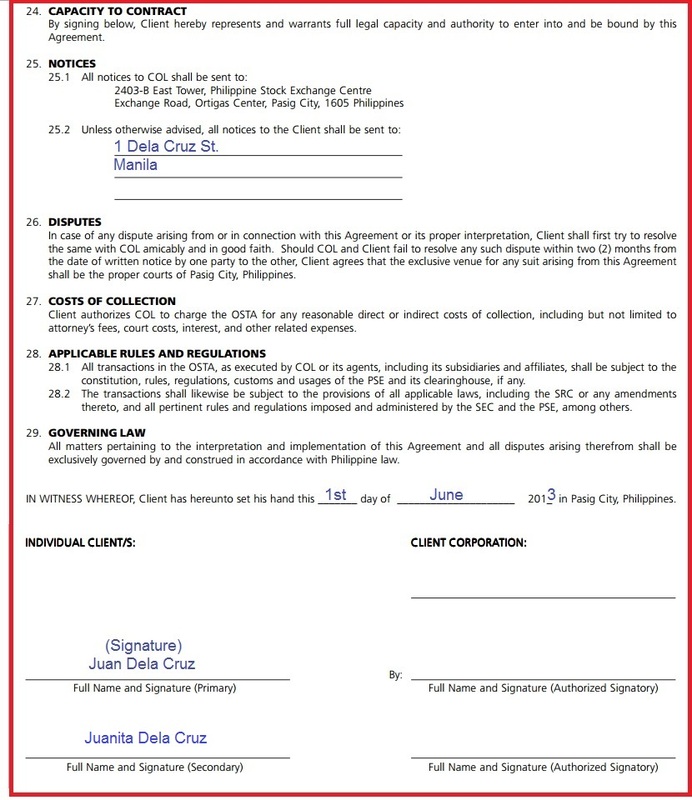 Last is the signature part on page 4 of Online Securities Trading Agreement. Please write your address on #25.2. Write the date when you signed the document. Write your name and sign on the first signature line (Primary). We also have 2 signature cards to sign, same as what banks usually require us when we open an account with them. For Joint Accounts, it is basically the same procedure, except that you need to write down the details of the other party on the ‘Secondary Account Holder’ portion. Secondary Account Holders may be your spouse, parent, sibling, adult child, a friend, any relative or anyone for that matter. For Minors (below 18 yrs), parents may open an ITF Account for them. This is how to fill out the app. Instead of ticking off ‘Individual’, tick off ‘Others’ and write ITF. On the ‘Secondary Account Holder’ portion, write the details of the child. On the signature portion, the adult signs as the Primary Account Holder on the first line, and writes the name of the child on the second line. Be sure to put on the date when you accomplished the forms. Same thing here and on the signature cards. The adult writes his name and signs on the first line, and writes the name of the child on the second line. In addition, the Primary Account Holder must print and sign the Supplementary Form for ITF Accounts, and attach it to the app before submitting. There you have it. Now, that you’ve filled out the forms, just attach a copy of your ID (please sign on the copy 3x) and a billing statement (credit card, electric, water, mobile, phone, bank statement, etc.). Once everything is ready, either you submit personally to COL or have it picked up (within Metro Manila only). Call COL’s hotline at 651-5888. For TrulyRichClub members, we do have a point person in COL to whom you can scan/email the documents first before mailing just to make sure everything is ok to avoid delays. Please pm me in our exclusive TRC social site and I will give you the name and email. Yes, just leave it blank. Hi joey, this is my 1st time to try truly rich investment. Would like to ask to whom should i email my scanned COL forms for the application, my ID and billing statements? I’m sending you email, Aba. Hi joey, please send me an email too. I have the same question with aba. thanks. hi joey can u send me too, the email address and if you also guide me in filling up the application for col? i’m also OFW, no bank account yet in phiippines. but i do have bank account here in america po. and can i used my california id and bill statement here in filling up the applicaiton? but billing statement and bank account available in korea. still can i open an account @ COL? Yes, it doesn’t matter where in the world you are. As long as you comply with the requirements of ID and bill statement, you can open an account with COL.
Hi Mam, kindly send me the email of the COL representative to whom I’ll send my COL application forms and requirements. Thank You. Hi Joey! Kindly email to me the contact person too. BTW, this is just for checking purposes right? And if everything is okay then we have to send the documents via courier? Hi Marianne. Are you a TRC Member? If not, you can always email the docs to helpdesk@colfinancial.com Yes, it’s just to check whether the docs are ok and the forms completely filled out, but you still have to send them via courier. Another thing you, or anyone could do, is to fill out the forms online, and one of COL’s agents will get back to you to give you further instructions. I’m a TRC member Joey. How about if yung billing statement nya kasama yung name ng kanyang partner. Is it okay? She forgot her SSS and TIN number, okay lang ba na wala yun? By the way, she `s working in Canada. what if we want to have joint account , We’re going to fill up the primary and secondary account holder right? and what are requirements needed? thank you so much ms joey. Yes. The requirements would be the same: ID and bill statements. I am a TRC member and currently living in Abu Dhabi. Can you please send me the name and email address of the COL representative that will check my application form? Also, if I want to make my 2 kids and husband as my beneficiaries, do I need to fill up 3 application forms for each? So will that give me 3 account numbers? One more, as I am in Abu Dhabi, is it okay if I’ll just send my application forms and billing statements/identification cards via courier? Yes, sure, Kenneth. I’d be very happy to assist you. But thing is, if you join TRC, it won’t be just me who would lend a hand, but all the active members who are always surfing our own, exclusive social site. Trust me, you will be surrounded by a lot of experts in different fields who are all willing to extend help to any member at any time. Can you please send me the name and email address of the COL representative that will check my application form? Thank you! Hi sis joey just finish watching your interview with alan I’m a newbies, kindly send the name of our point of contact where i can email my scan copies of accomplished COL app and I,D’s. Another thing please tell me to how to enrolled my children here in the TRC but they are not minors any more. Thanks a lot. Can you please help me, what are the documents that I needed to prepare and to whom do I need to send the documents, ‘Coz I am an OFW. By the way, If i am already a member of COL, do I need to pay a tax even I am an OFW? Each time we trade (buy/sell stocks), we already get taxed. No one is exempt from that. 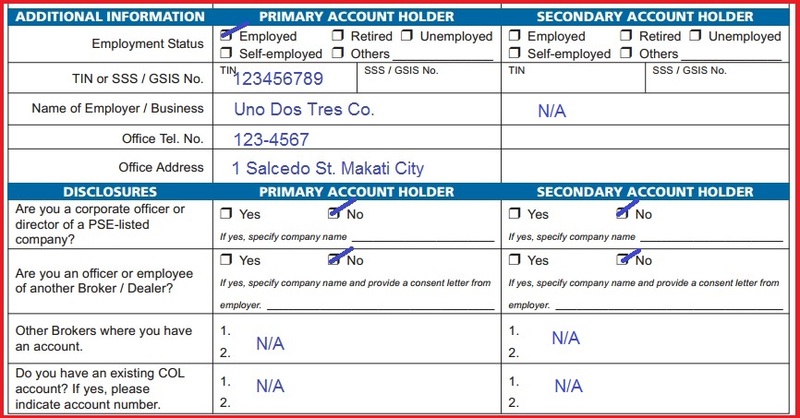 Im a new TRC member and Im interested sa Stock Market and I hope you could guide me kasi I need to do something about my financial problem and I believe in joining TRC I will be Spiritually and financially stable.Mam I would like to ask if the secondary acoount holder is my benificiary and she needs to submit the same requiremnts too?Thank you. Hi Theresa. The Secondary Acct holder is not your beneficiary; she is a co-principal. Meaning, both of you are owners of the acct. COL acct is so much just like bank accts. No beneficiary or heirs. If something happens to the principal acct holder, the acct is frozen and automatically forms part of the estate. The heirs would have to go through extra judicial proceedings to stake a claim. Can you please send the name and email add the COL representative for my COL application checking. Im TRC member. I read through your instructions, kindly send the email w/c i can send the necessary documents for checking. and the person who will assist me . Thanks much! hi joey i’m already a member of trc but i don’t have col account yet. i’m ofw here in taiwan, how can i sign for col application form? Hi, Ma’am. Kindly send me the email of the COL representative to whom I’ll send my COL application forms and requirements. Thank You. I am a new TRC member. Can you please send me the name and email address of the COL representative that will check my application form? Also, please tell me how to open an account for my kids (minor and non-minor). Thanks and more power. Im still waiting your mail if you can send a name and email add the person assign to check my application for COL. Im a TRC member. Looking forward your soonest reply. Can you please send me the name and email address of the COL representative that will check my application form? What will I do next after I fill up the forms? hi! Newbie here. I just join TRC few days ago. I’m working here in abroad. No need to give that info if you don’t have it now. Have a good day! I am new in Truly Rich Club since yesterday after the confirmation. Kindly send to me the contact person in COL in which i will send my application letter for opening an Individual Account. Pleease send me the email address so I could check if the forms and other requirements are okay already. And if my secondary holder has no billing statements, etc., is the copy of his/her ids enough or okay already? Thank you and Gob bless us all! For secondary acct holders, they don’t need to have billing statement. I will email you the contact details of our point person. Have a good day! I am new in Truly Rich Club after the confirmation. 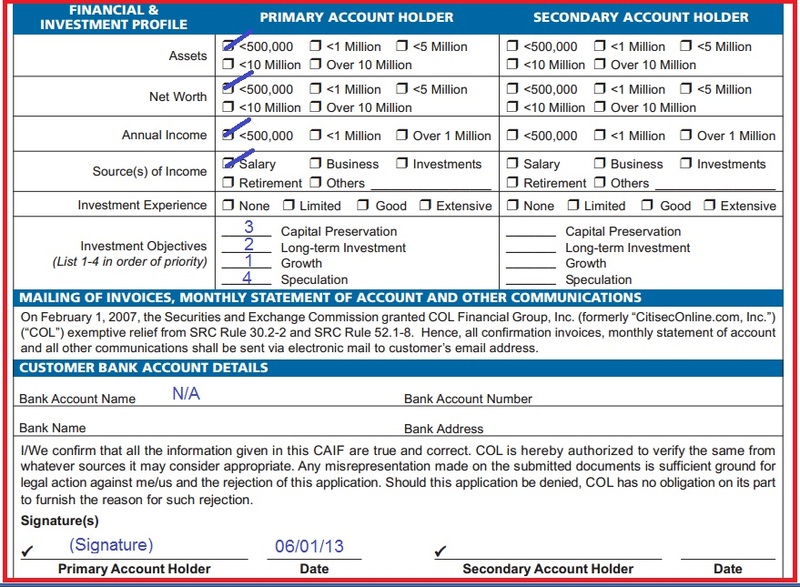 Can I ask for the contact person in COL in which I can send a copy of my completed COL financial form for opening an Individual Account so I can verify if everything is filled up correctly? hi joey! i’m in the process of filling out the forms. please send me the email of the contact person in col so i may scan and email the docs if everything are ok. thanks! To Christ The King!!! i am new and wanted to open account in col and i dont know if all i signed was right, can you give me info where and how to check my papers before i send to courier. sino po ang papadalhan ko ng papers ko nasa japan po kasi ako. at hindi pa po ako member ng trc. thank you po and hoping to get a wonderful responce on my email. I want to send my application via email for checking before I send it via courier. Kindly provide the email address where i can send the application. Hi, I’m a member. Please send me the contact details of the point person in COL. I am sending my application form to COL, can you please send me the name and email address of the COL representative. I am new to TRC and I want to know please where I can submit a scan copy of my forms and documents prior to sending to COL? I am a OFW so I will be sending thru courier my documents, please advice! Hi Joey, I’m a newbie member of TRC living here in Norway. I would like to ask about the TIN and SSS No. in COL application form, I forgot mine, is it okay if I leave it blank? Yes, it should be ok. Just leave it blank. Good day. I am a new member of TRC. I want to send my application via email for checking first before I send it via courier. Kindly send me the email address where i can send the scan forms and docs. Thanks! I am TRC newbie member, an ofw from Abu Dhabi. Can you please send me an email to where i can submit a scan copy of my forms and documents prior to sending to COL? It would be a joint account with my husband. Please guide me, It would be a big help. In the specimen signature card, there is a box for the TIN..I do not have a TIN since i work outside of the philippines…what should i put instead? In the application I put my sss number instead of the TIN..should i put my SSS number in the specimen signature card as well? 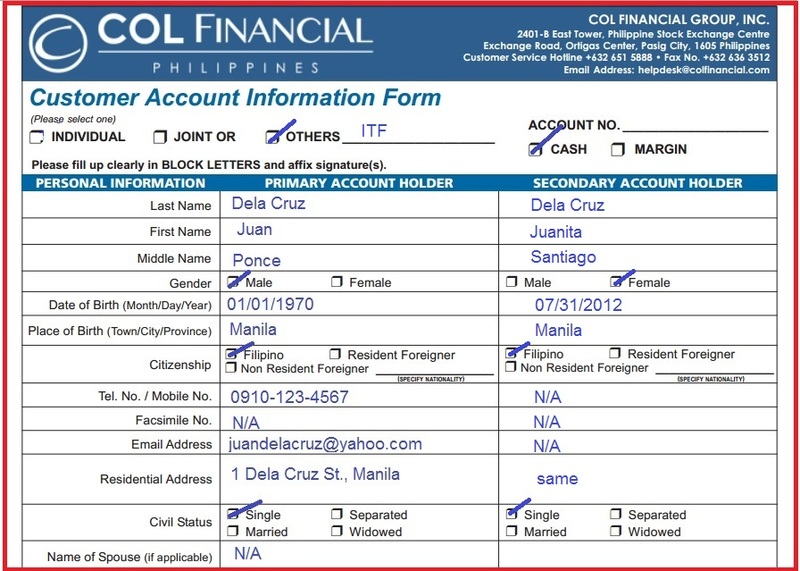 I’m just about to start opening an account with COL. I’m here in Saudi Arabia, Can I just scan the application form and send it to my relatives in the Philippines via email so they will be the one to send it to COL office in manila? Hi. COL needs the original documents as required by PSE. Can’t email. The email is just to make sure your docs are complete to avoid delay in the processing. You may leave it blank. If you put your Mom or Dad as a co-holder, you’d have to send them the forms so they could also sign. which of the 2 should we use? Any of the addresses there. Anyways, it’s just 1 bldg. Can you also send me the email address / name of the person who can check my application form and documents for COL? Thank you! 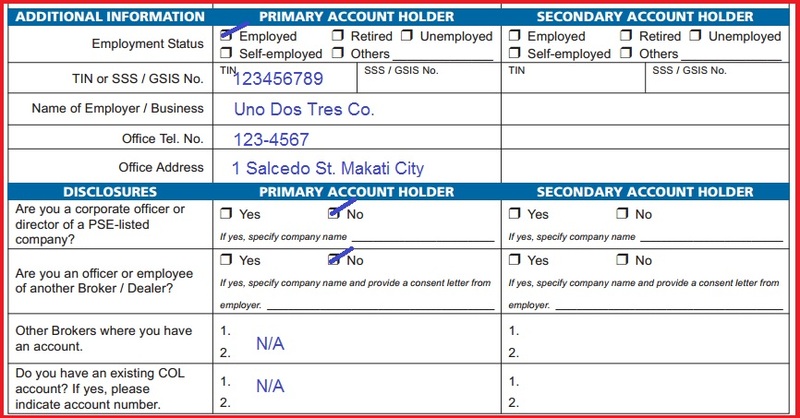 i want my husband to be a secondary account holder.but he is not here.he is a OFW. so pano po yun Signature nya s COL application? Hi Ms. Joey! I am a new TRC member. I have few questions about opening COL account and filling up the forms. Can I ask for your email address? Thanks! HI ms. joey, i am an ofw in oman po regarding requirements for application is it all right if i will give my bill statement from the bank here in oman? but my concern is that they might use the address i have here in oman, something that i dont want since i am also planning to transfer in other country. I want my philippine address to be honored if ever. Can i also get the email of the person to which i will send my scanned requirements first before i send thru courier. thank you! Hi. Yes, pls print it out and submit (mail via courier) together with copy of ID and Bill Statement. COL needs to see the orig app form w/ orig signature. I am a TRC member. I already have a printed a COL form, I woul like to ask for the name and email address of the point person in COL.
HiJoey… Na print at na filled up ko na po yung application form. ano po email address para i email ko yung scanned copy ng form ko? ZbllvSpjD9AI Hi sis joey can you please send me the email address so i can send my scanned forms,thanks. Hi joey. Can you please send me the details on where to send the details/requirements so I can open an account to COL. Thanks. Have you read ‘How to Open a COL Account’ here? But I’ll be sending you email, too. I’m an OFW in KSA with a year remaining b4 going home, just want to be member of TRC soon, then later want to apply for COL account, but I don’t have any billing statement here, except for the bank atm we use when we received our salary, does this inquiring slip can be use to submit together with my ID’s for applying for col account? HI Jon. If you want to be a member of TRC, you don’t need any of those requirements except sign up through any TRC link you find here in my blog. Just click any TRC logo or TRC word you find here. As for your COL acct, the sooner you open an acct with them, the better. For the Billing statement, you can use any bill that has your address on it, even if it’s not under your name (landlord’s perhaps). The reason for the bill is to verify your address. So, just send anything that has your address on it, and email COL (helpdesk@colfinancial.com) and see if they’d accept the doc you submit. I just already a member of TRC upon receiving a confirmation email today. I would like to ask you, what is the email of representative to submit my scanned COL application and ID docs for approval before I send it via courier? Please send me the contact person in COL, via email. I am a TRC member. Hi joey, please email me where to email my scanned COL Financial application. This is my first time to invest. Thank you very much for your guidelines. It is very helpful.